This week’s featured image is In the Fields Mandala, a bright green and yellow kaleidoscope like image perfect for spring — shown here on a large wall tapestry available for purchase from RedBubble. Also featured this week is a new product available at Society6: fanny packs! Check out the product collage below to see more (listed clockwise from the top left): acrylic art print from Curioos, fanny pack from Society6, large throw pillows from RedBubble, and wall clock available at RedBubble. Curioos | RedBubble | Society6 all offer products with this design. Click the links to see more, and stop back next week to see another featured design. My latest mandala design, Pastel Purple & Blue Mandala, is featured in the new work spotlight this week. 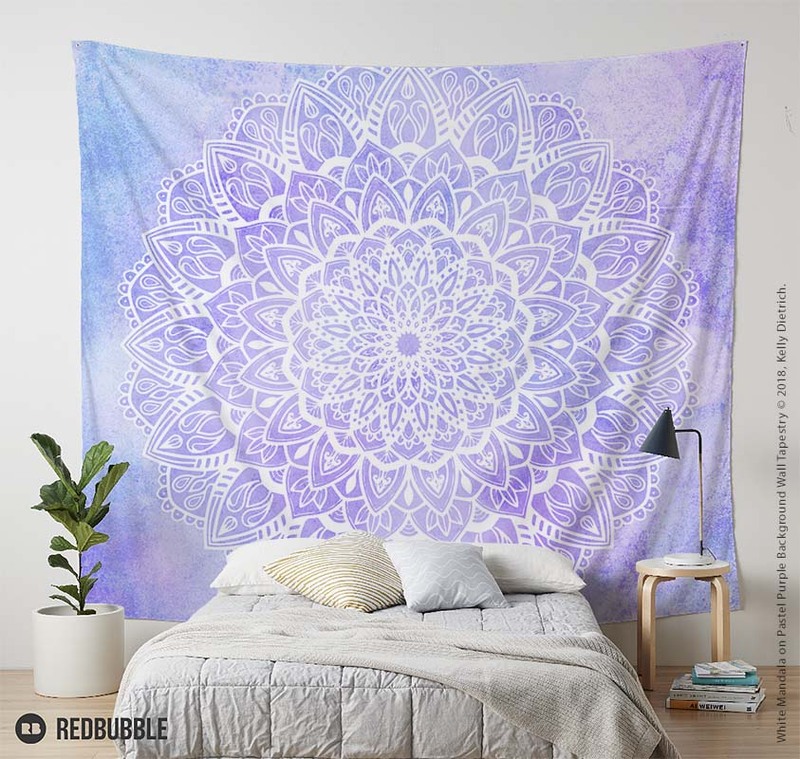 Shown above: Pastel Purple & Blue Mandala Tapestry available from RedBubble. This week’s fractal kaleidoscope image is a lovely mix of lighter shades of purple, blue, and white in a 24-spoke mandala image. It’s a design perfect for kids’ rooms, girls’ bedrooms, meditation spaces, or even used as a bedspread or picnic throw. Products listed clockwise from top left: iPhone phone case, queen size comforter, 3 pack of lined notebooks, and coasters shown in the Pastel Purple & Blue Mandala design — all available from Society6. Swing by next Thursday to see my latest design! In the new work spotlight this week is Cerulean & Violet Spiral, a new floral fractal design in shades of purple and blue. Shown above: framed art print from Curioos. And for a quick preview of some of the items now available, see below (clockwise from the top left): Cerulean & Violet Disk Print from Curioos, women’s all-over print t-shirt from Curioos, large wall tapestry from Society6, and king size duvet cover from RedBubble. Thanks so much for stopping by! Be sure to check back every Thursday for another new mandala, fractal art, or pattern design. I decided to go back to my roots and create a new photo-based mandala — the colorful Kaleidoscope Mandala — shown above in the 4’x4’ wood wall art piece, available in my Society6 shop. This design is available on products in my Curioos, RedBubble, and Society6 shops. Check out the photos below to see a quick preview, or click on the shop links above to see the full product range. 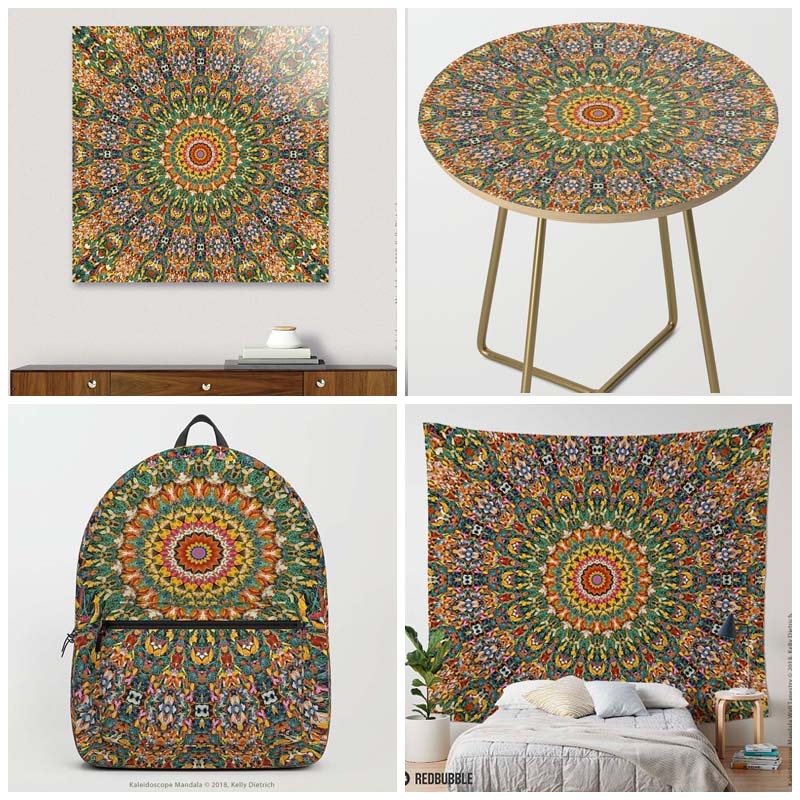 Products clockwise from top left: Kaleidoscope Mandala acrylic glass print (Curioos), Kaleidoscope Mandala round side table (Society6), Kaleidoscope Mandala wall tapestry (RedBubble), and Kaleidoscope Mandala backpack (Society6). In the new work spotlight this week is the White Mandala on Pastel Purple and Blue Textured Background. 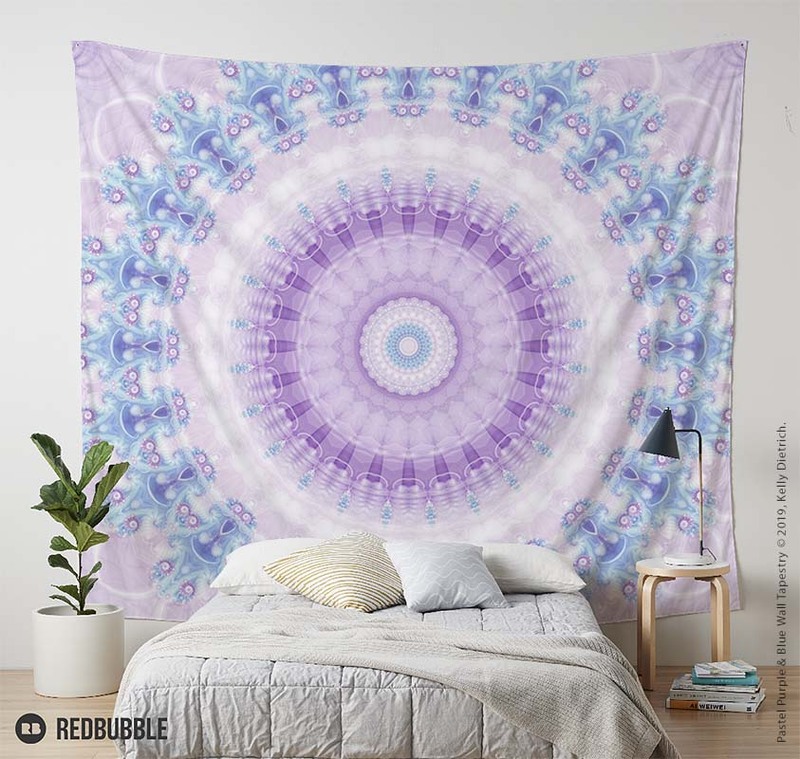 Shown above in my shop at RedBubble as a large wall tapestry. This mandala is another addition to my white mandala series that also includes my Blue Sky Mandala and Pink Sky Mandala designs. All colorways of this design are done in pastel colors and have a light, airy feel. So here's a quick look at some of the products I have available that feature this mandala design (clockwise from top left): zippered pouch (size medium) from RedBubble, square scarf from RedBubble, 26" throw pillows from RedBubble, and shower curtain from Society6. You can see the entire product lines at each individual shop by clicking on the following links: Art of Where | Curioos | RedBubble | Society6 And, be sure to stop by next week to see my latest featured design!